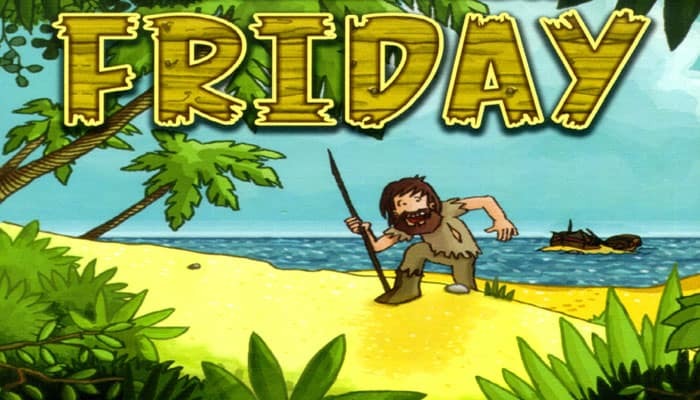 Friday is a solo adventure. While playing you are trying to guide Robinson through the game. He must win against two pirates without dying to finally leave the island again. At the start of the game Robinson is not very cunning. In this game the pile of fighting cards represents his abilities. By comparison Robinson's health is in good shape and he starts with many life points. You have two possibilities to help Robinson. 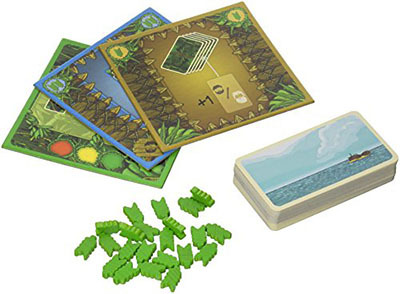 You can either cleverly beat the hazards of the island and receive additional cards to improve Robinson's fighting abilities, or you deliberately lose against certain hazards and pay with Robinson's life points to remove unwanted fighting cards from play. 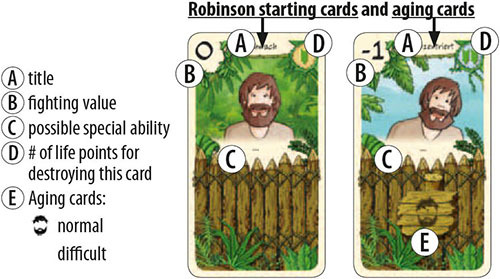 During the game you will improve the quality and quantity of your fighting cards thanks to both possibilities and help Robinson with his newly gained abilities and knowledge to win against even more difficult hazards. However, life on the island is energy-sapping for Robinson so he is forced to always add aging cards to his fighting cards pile. These cards are all cumbersome, so you'd better remember to keep them in mind when planning your next steps. It is up to you. 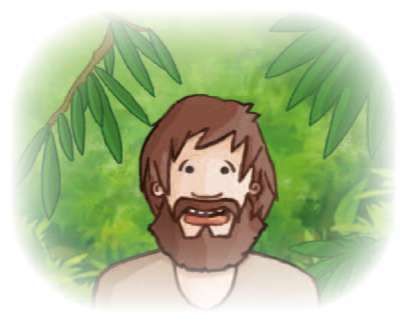 Use Robinson's life points cleverly and choose the correct hazards to keep Robinson healthy and strong for the final fights against both pirates. The game offers several difficulty levels. Firstly, we explain the easiest game to you - Level 1. As soon as you win this level, you can try three additional levels and try to play against the next challenge. Do you finally beat the game in Level 4? 1 Sort the step cards and place the pile in front of you. The green card should be visible on top of the pile, below are the yellow and red cards. The game starts with the green step. 2 Remove the aging card "Very Stupid" from the game. Sort the remaining 10 aging cards in two piles ( 7x normal A and 3x difficult B ), shuffle both piles and place them as a single face-down stack on the aging storage board. Place the normal aging cards A on top of the stack. You will need these aging cards later during the game. 3 Shuffle the 18 starting cards and place the face-down stack on the Robinson storage board in front of yourself. These are your first fighting cards. 4 Shuffle the 30 hazard cards and place the face-down stack on the hazard storage board. 5 Shuffle the Pirate cards, draw two random pirates and place them face-up as your final opponents. Place the remaining Pirate cards back in the game box. 6 Take 20 life points for Robinson and place them next to your Robinson stack. Place 2 more life points as the reserve next to the play area. 7 Set aside some space next to the Robinson and hazard stacks for the appropriate discard piles. During the game you will help Robinson to fight one hazard in each game turn. You start the game in the green Step, when the hazards are still mostly harmless. Draw the two topmost cards of the hazard pile. Choose one of the two cards as the actual hazard and place it face up in front of the Robinson stack. Discard the other card on the hazard discard pile. The white box on the left side of the hazard card shows the number of fighting cards you can draw for free to fight against the hazard. During the green Step you must get fighting points equal or in excess of the green hazard value . You draw one fighting card after another from the Robinson stack and place them face up on the left side of the hazard card. You can draw and place new cards on the left side until the number equals the value of the white box. After drawing the free cards you can »sacrifice« additional life points and place them back into the reserve to draw 1 fighting card for each sacrificed life point. You place the additional card(s) on the right side of the hazard card. After drawing each fighting card you can always decide to use the special ability of any drawn face-up fighting card (regardless of left or right cards) in any order you like. You can use each special ability only once during the fight against the hazard and turn the chosen card 90°. Only after using the ability completely, you can activate the next ability of another card. Note: You must definitely use the special abilites of the aging cards! After you draw at least one fighting card against the hazard, you can decide to stop drawing additional cards, even if you do not draw all the free cards as written in the white box. You choose to do this for one of the two reasons: Either you have already won against the hazard or you deliberately lose against the hazard. During the game it is very important for you to decide if you want to spend more life points to win a fight or to deliberately lose the fight and pay to remove worse cards. Both decisions are integral parts of your strategy. It is not unusual to lose several of the first fights in the »green step«. This is part of this game! The fight does not end automatically. You can use all remaining special abilities. Only if you want to end the fight, you compare your fighting points with the hazard value and finally finish the fight. 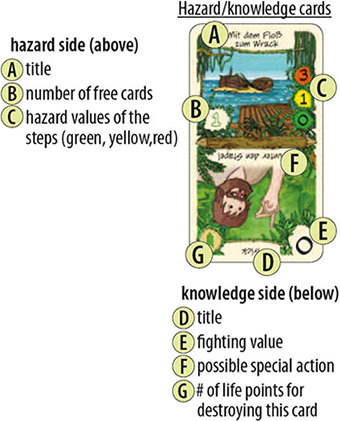 If the sum of all fighting points of your face up fighting cards is at least equal or higher to the hazard value (matching the actual step), you beat the hazard and win the fight. Place the hazard card together with your played cards onto your discard pile. The gained hazard card converts to a new fighting card in your Robinson pile. You use the knowledge side of the card. If you deliberately lose the fight and the sum of all fighting points of your face up fighting cards is less than the hazard value, you must pay life points to the reserve matching the number of points you are missing to win against the hazard (the difference of the hazard value and your total fighting points). For the life points you pay in this manner you can destroy played fighting cards and remove them from the game. You need one life point for one of the starting or knowledge cards . ou can only destroy face-up fighting cards, which are played during the actual fight. All cards in the Robinson stack, the Robinson discard pile or the actual hazard card are safe. After Robinson sacrifies a life token he succesfully explores the Island thanks to the card »genius«. From now on he can use the weapon in the following fights. If there are at least 2 hazard cards left in the hazard stack, start again with action 1. Draw 2 more hazard cards, choose one and fight against it in the actual Step. If the hazard stack is empty, the game continues with the next (more difficult) step. Place the topmost Step card back in the box and continue the game with the following Step (after the green Step you play the yellow Step, after the yellow Step you play the red Step. After finishing the red Step you finally fight against the pirates). At the beginning of a new Step shuffle the hazard discard pile and continue again with action 1. At the end of a Step, if there is only exactly one card left in the hazard pile, you draw this card and can decide if you want to fight against this card in the actual Step. Instead of fighting you can decide to discard this card without fighting it and continue with the next Step (similar to an empty hazard pile). If you need or want to draw one or more fighting cards from the Robinson stack, but there are not enough cards left to draw, you draw the remaining cards until the stack is depleted. Afterwards you must take the topmost face-down aging card from the aging stack and shuffle it into the fighting cards (Do not look at the aging card!). Place all cards back on the storage board as the new Robinson stack and draw the missing cards. You only shuffle the Robinson discard pile, if you need to draw another fighting card (not already at the time, when you draw the last remaining card of the Robinson stack). After you finish the hazard stack a third time, you fight against the two pirates. The remaining hazard cards in the hazard discard pile are not used anymore. You choose one of the pirates, place him in front of Robinson and start the fight. The pirates act exactly like hazard cards. After you beat the first pirate, you place all drawn fighting cards on the Robinson discard pile and you must immediately fight against the other pirate. You must win against the pirates! You cannot decide to lose and pay with life points. If your played Robinson cards do not have enough fighting points to beat the pirate, you must sacrifice life tokens to draw more Robinson cards. After you beat the second pirate, you win the game. If you need to pay a life token during the game and do not have any left you immediately lose the game. Having zero life points is OK, but if you need one more life token you lose the game! Level 1 (as written in these rules): The aging card Very Stupid is removed from the game. Start with 18 Robinson starting cards and 20 life points plus 2 more life points in the reserve. Level 2: Like Level 1. In addition you draw a face-down aging card and shuffle it together with the 18 Robinson starting cards (do not look at the aging card!). Level 3: Like Level 2. Before performing all the steps above, shuffle the Very Stupid card together with the other aging cards. Level 4: Like Level 3. Start with only 18 life points plus 2 life points in the reserve. This is the real game! After each game you can calculate your victory points. Will you get better with more experience? Take all your fighting cards (together with your Robinson discard pile) and add all the fighting values. All aging cards have a value of -5 regardless of their real fighting points for this purpose. Add 15 points for each defeated pirate card (undefeated pirates are ignored). Add 5 points for each remaining life point you still have in Robinson's storage (you only have them if you win the game). Subtract 3 points for each unbeaten hazard card still in the hazard discard pile. When calculating the scores you can compare your different games and successes in each Level. The higher the level, the more difficult it will be for you to get a high score.